Wanna Be The Nicest Guy On Earth? So, after weeks and weeks of practicing, after numerous blisters from relentless hitting of various percussion instruments, I get to live out my fantasy of being a B-52 on Friday night. I jokingly asked of the Universe at that point: “Hey – who wants to do a B-52s tribute with me just so we can do this song?” And at first, the Universe responded in the form of several people clicking “like” to denote their approval of my choice of videos. But the Universe had much more in store for me. 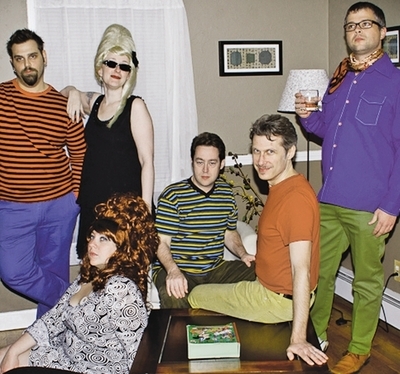 About a week later, I was at a Varsity Drag show when Varsity Drag’s drummer (my friend Josh) approached me and asked, “Hey – were you serious about that B-52s thing? Because we’re putting something together, but the girl we had playing Cindy had to drop out.” One thing led to another, and before I knew it, I was sitting in a living room in Cambridge, listening to the first two albums and making out possible playlists, alongside Josh and my new friend Ashley, who would be playing Kate to my Cindy. “We still don’t have a Fred,” Josh said. “I know exactly who to ask,” I replied. Michael’s name was added to the rapid-fire exchange of emails as we continued to discuss song choices (No “Love Shack,” but we really should do “Love Shack” if it’s a TRIBUTE and people are going to WANT to hear it, but…okay…”Love Shack,” but only if we do it FIRST). It was looking good. And then our bass player had to drop out. We had our first full band practice (at our guitarist’s house) in early September. My God – it was MAGIC. All the shuffling around and last-second replacements yielded an absolutely perfect mix of people playing these insane, wonderful songs. I won’t say we sound EXACTLY like the B’s, but we’re pretty damn close. We’ve come at this with all the love and respect and admiration for the REAL B’s, and it shows. We all grew up with this stuff. We all remember seeing and hearing them for the first time and thinking, “These people are FREAKS. I am NOT ALONE.” We are channeling that joy in all its bewigged glory. We are dancing this mess around. We are Bikini Whale. This entry was posted in Uncategorized and tagged b-52s, bikini whale, Halloween, tribute. Bookmark the permalink. God I wish I was going to this! Good luck, you guys!